A new tour of Torben Bett’s critically acclaimed play Invincible begins at Northampton’s Royal & Derngate. Presented by The Original Theatre Company, this production is back on the road for a second tour, by popular demand. Alastair Whatley, artistic director of The Original Theatre Company, said: “We are delighted to be taking Invincible back on the road in 2017. “Torben’s state of the nation comedy reached out to audiences across the UK in 2016 with his vision of a nation divided, cleft in two down the Watford Gap. “One night, they open their doors to their next door neighbours Dawn and Alan. Alastair Whatley, Emily Bowker and Graham Brookes will reprise the roles of Oliver, Emily and Alan respectively. Elizabeth Boag joins the 2017 tour as Dawn. Original direction was by Christopher Harper, with the new tour under the direction of Stephen Darcy. Poet and dramatist Liz Lochhead described playwright Torben Betts as “just about the most original and extraordinary writer of drama we have”. His play The Unconquered won Best New Play 2006-07 at the Critics’ Awards for Theatre in Scotland. He has also been compared favourably to legendary playwright and theatre director Sir Alan Ayckbourn. 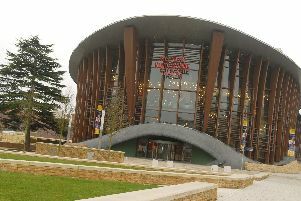 A spokesman for the Royal & Derngate in Northampton said the show promises “to be an entertaining night of observational comedy”. It comes to Northampton before heading out on a tour of the United Kingdom. Tickets for the show cost between £16 and £30.50. Performances take place at 7.45pm each evening. There are matinees on Thursday and Saturday. To book call the box office on 01604 624811 or visit www.royalandderngate.co.uk.